'Artists Are Like Water' runs through Oct. 27 at Lookup Gallery, 16290 Main St., Guerneville. ART TRIP Bill Pullum, center, artist Marie Lorenz, right, and others prepare to head downriver for an artistic journey. Group art exhibits can be a tough deal for artists and art lovers. The concept has to be strong enough to bind the art pieces together, and engaging enough that casual art fans won't feel like they're stuck in some kind of private joke. For the curator, compiling such an exhibition often means dealing with egos and inside politics, and balancing financial interest with personal favors, conceptual needs and technical limitations. 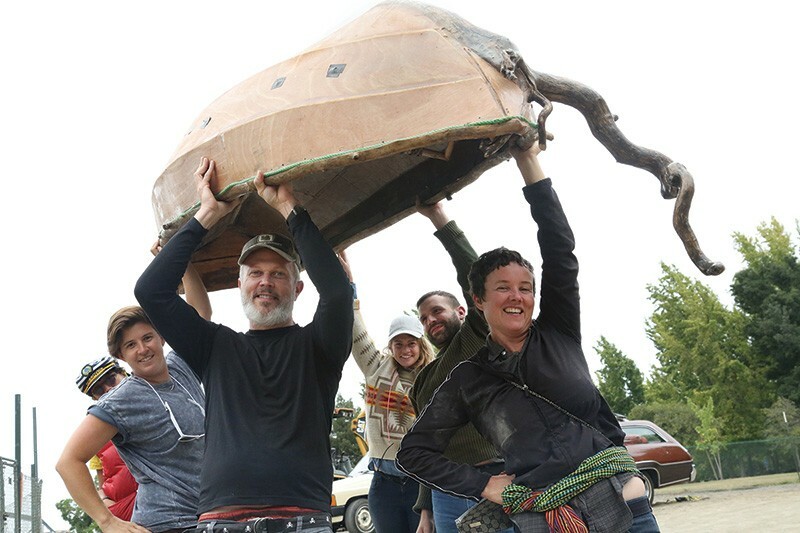 In the case of the show "Artists Are Like Water," however, the curator and three out of the nine exhibiting artists bonded in an unusual way before the opening: they spent four days floating down the Russian River, camping and gathering raw materials for making art along the way. The exhibit opened Aug. 27 at Lookup Gallery, the semi-hidden art space in the back of the Guerneville Bank Club building. Focusing on art that "sinks time into a dream," according to the artists' manifesto, the exhibit includes work by Los Angeles–based artists Alyse Emdur, Cammie Staros and Jeremy Everett; Constance Hockaday from Oakland; San Francisco's Colter Jacobsen and May Wilson; Sausalito's Will Rogan; and two artists from the East Coast, New York City's Marie Lorenz and Sto Len. In different ways, each piece relates to flotation, liquidity and sailing, directly and metaphorically. To underscore the concepts of escape and freedom, "Artists Are Like Water" was ushered into the world by a three-day, four-night "floating art studio" last month. Along with Lorenz, Wilson, Hockaday and curator Betty Nguyen, local artist Greg Stimac, cinematographer Yuko Inatsuki and Guerneville Bank Club owner Bob Pullum came along, too. "We're looking to bring in nationally known, contemporary artists and expose them to the natural beauty of the area and let that influence new and interesting works whenever possible," says Pullum. The floating exhibit started with a festive dinner at the Warnecke Ranch in Healdsburg and flowed from Healdsburg to Jenner with overnight stops at Mirabel Park in Forestville, Johnson's Beach in Guerneville and Casini Ranch in Duncans Mills. "I was thinking about how close in proximity the Russian River is to the Lookup Gallery—300 feet, actually—and definitely wanted to curate at least one show approaching it," says Nguyen, an independent curator and art director in the Bay Area. "The show is a response to time spent living and breathing in that moment of observing what surrounds us. Have you ever tried drawing while paddling downstream? It's about being mindful, the art of living and finding our balance." "Coming from New York, it's interesting to see how people use the river, and at the same time it's a pristine place," says Lorenz, who built her own boat for the trip. "I love to see how the landscape evolves."